This one-skillet meal is wonderful on it’s own, and is equally delicious topped with leftover grilled chicken or steak. 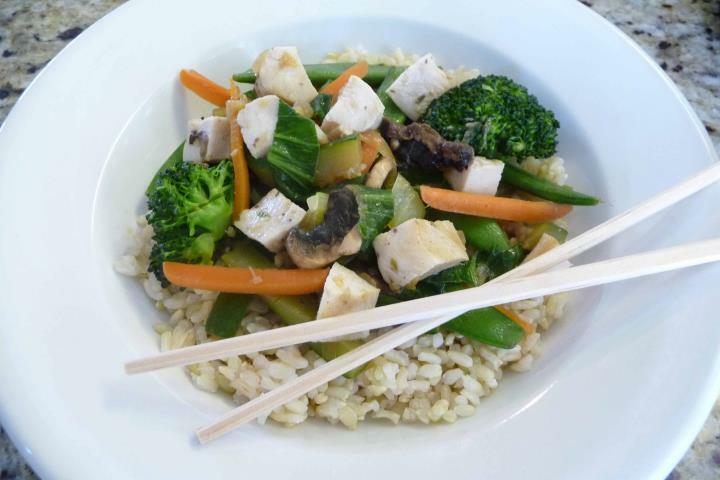 We enjoy cooked soaked brown rice for this particular dish, but if you’re a white rice fan, you may find the article “White Rice Better Than Brown?” by Sarah of The Healthy Home Economist very liberating. It discusses the health benefits of white vs. brown rice. Time-Saving Tip: Have you heard the term “mise en place?” It’s a French culinary term for having all of your ingredients prepped and ready to go before starting you start cooking. By learning to embrace “mise en place,” you will not only save time, but also greatly reduce your stress level in the kitchen, as well as improve your cooking skills. Add oil, green onion and garlic. Cook until garlic becomes fragrant, about one minute. Then, add carrots, snap peas and bok choy stems. Sauté about 2 minutes (stirring constantly) and then cover for about 2 minutes until veggies begin to slightly soften. Next, add zucchini and broccoli. Sauté uncovered until broccoli begins to slightly soften. Then season with ground ginger, 1-2 tablespoons of soy sauce (or soy-free sauce) and salt and pepper to taste. Toss well to combine. Serve over cooked or steamed rice. 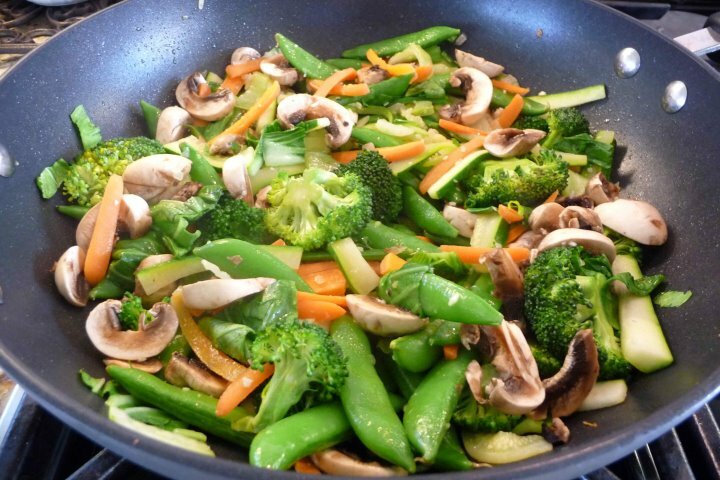 Please note, you can easily customize this recipe using your favorite veggies.